Logitech G, a brand of Logitech, announced the Logitech® G502 HERO Gaming Mouse, an upgraded version of the iconic Logitech G502 Gaming Mouse. Retaining the same iconic shape as the original, the new mouse has been updated with the latest technologies, including Logitech G’s next-generation HERO (High Efficiency Rated Optical) 16K sensor, the highest performance and most accurate sensor available today. Coupled with Logitech G’s exclusive LIGHTSYNC RGB technology, 11 programmable buttons, five optional weights and braided cable, the world’s best-selling gaming mouse just got even better. The ultimate sensor for speed, accuracy and responsiveness, the Logitech G502 HERO boasts Logitech G’s industry-leading HERO 16K sensor, the highest performing and most efficient gaming sensor Logitech has ever made. Featuring an all-new lens and updated tracking algorithm to deliver ultra-precise tracking with no acceleration, smoothing or filtering over the entire DPI range, Logitech G’s revolutionary HERO 16K sensor is capable of exceeding 400 IPS and delivering 16,000 DPI tracking with pixel-precise accuracy. Each aspect of the Logitech G502 HERO was built to adjust to different styles of gameplay. The mouse has 11 buttons, programmable through Logitech Gaming Software (LGS), to customize commands and macros, adjustable weight system with five 3.6g weights and a dual-mode hyper scroll. Lighting can be personalized across approximately 16.8 million colors using Logitech G’s LIGHTSYNC RGB technology. Onboard memory stores up to five profiles, so you can take your customized settings with you. With the same iconic design as the original, the Logitech G502 HERO is the ultimate in comfort, with textured rubber side button grips and an updated braided cable for optimal feel and performance through long gaming sessions. The mouse’s upgraded mechanical switch, developed in partnership with Omron, delivers extreme performance and a 50M click durability. 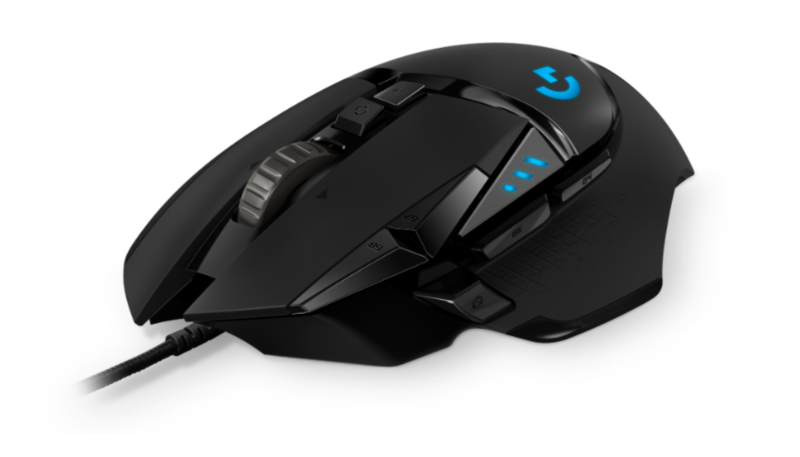 The overall weight of the Logitech G502 HERO, and the mouse’s center of balance can be adjusted based on the placement of the adjustable weights. The Logitech G502 HERO Gaming Mouse, available in black, is available for pre booking from November 27, 2018 exclusively on www.amazon.in for a retail price of INR 6495/-. For additional information please visit our website, our blog or connect with us on Facebook, Instagram or Twitter.